And while I'm not here to share with you a holiday gift guide (I'm sure you've been bombarded on every commercial front), I thought I'd at least help by taking some of your holiday sartorial stress off the table. I've written a few posts about this in the past (see here, here and here) but I thought I'd add a twist on the classic pant suit to the collection. 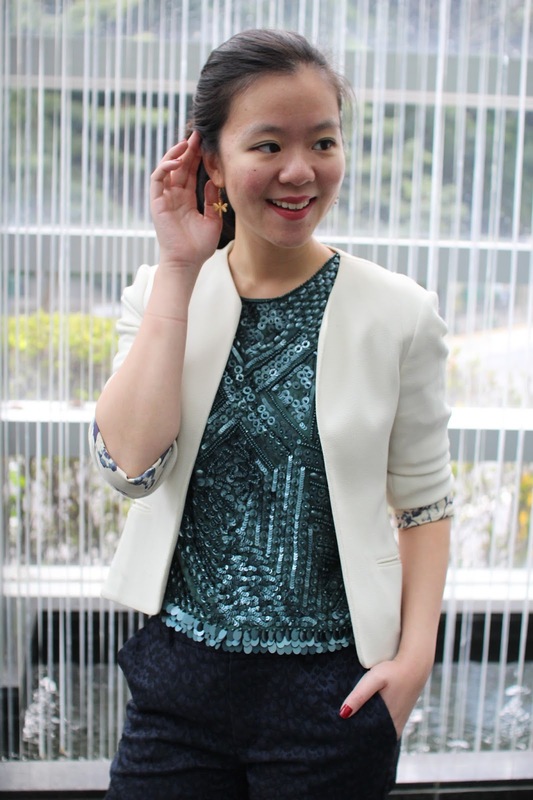 For this look, I switched out my black slacks for a pair of patterned pants and layered a sequined top (instead of my usual silk shirt) under my blazer. Add a coat of holiday red to your fingertips and a pair of dangly gold dragonfly earrings and voila, ready to rock around the Christmas tree. PS - From personal experience, this outfit is best paired with a side of gingerbread cookies and a glass of creamy eggnog (or mulled wine for you classy ladies). Sending you lots and lots of holiday cheer! Hello dear, you looked adorable in this dress and I am glad that you shared it here as it helped me a lot. Anyway, I am looking for some good ideas for corporate party ideas for planning this year. Do you know any source where I can get help?